Save with Big Lots doorbuster deals: $589 Simmons Manhattan 2-pc. Sectional; $189 Simmons Rocker Recliners; $20 Polaroid Wireless Speakers w/ Mini Tower & Bluetooth; FisherPrice Preschool – Buy 2 get 1 Free; $18 Whitman’s Chocolate Sampler; 20% OFF Storage Cabinets; $289 Simmons Bandera Fabric & Faux Leather Combo Sofa; $569.99 Serta Super Pillow Top Harmon Perfect Sleeper Queen Mattress + Box Spring – View Macy’s Black Friday Serta Deals; $60 Winter Wonder Lane 6-ft. Jackson Prelit 300 Multi-Color Cashmere Tree. 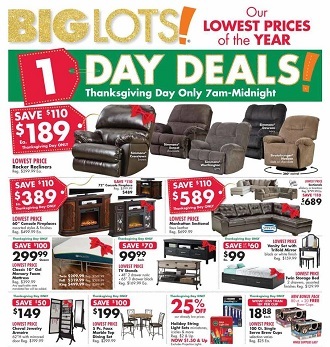 Find all Big Lots Black Friday 2018 Ads, offers and doorbusters. Don’t miss this year deals and promotions on furniture, toys, and more.